OTHER GEMS : ZIRCON. Luxury Sterling 925 Silver Jewelry White Topaz Ring & Earrings Set PRODUCT ID W040130. MAIN STONE GEMSTONE : TOPAZ. RING SIZE : 7.25. TOTAL WEIGHT 145.00 CT (TOTAL WEIGHT OF SILVER STONE) 29.00. Sterling Silver 925 faceted blue topaz pendant with chain and stud earring set. 2 cm including loop and bail by 9 mm. Chain is approx. 20" long including fully working clasp and is stamped 925 on the chain and on the clasp. This is a beautiful unusual 9ct yellow gold rope chain set with lovely oval cut blue topaz stones at regular intervals along the chain. Size of topaz stones is 7x5mm, chain width is 3mm. Necklace length 17.5”/44.5cm, Bracelet 7”/18cm. Gemstone - Blue Topaz. Shape - Round. Pendant Drop: 3.3 cm. Earrings Drop: 2 cm. Pendant stone: 1 x 1 cm. Earrings stone size: 9 mm x 9 mm. STERLING SILVER JEWELLERY SET MADE WITH 4 CARAT GORGEOUS CREATED TOPAZ. CENTRE STONE SIZE: 7mm x 7mm. This is for hygiene reasons and doesn’t affect your statutory rights. EARRINGS SIZE: 16mm x 8mm. PENDANT SIZE: 14mm x 8mm. A bargain ! Save on cost of buying individually. Stunning Rainbow Fire Mystic Topaz. Round Mystic Topaz set in genuine. Pendant & Earring Set. stamped 925 Sterling Silver. st.s &blue topaz pendant&drop earrings set. Condition is New without tags. Dispatched with Royal Mail 1st Class. Pendant - overall size 28mm x 19mm including bale (no chain). 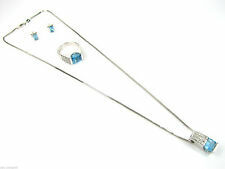 Pre-Loved, Silver & Blue Topaz Pendant, Earrings & Bracelet Set. ref xaod. It is adjustable and can be shortened to 16.5 cm. Pendant and Earring set. A pretty pendant with one 6x4mm oval Blue Topaz gemstone set into an ornate solid Sterling Silver Celtic design. Pretty stud earrings to match the pendant, featuring 5x3mm oval cut Blue Topaz gemstones set into a solid Sterling Silver Celtic design. A classic natural Blue Topaz pendant with matching earrings. The pendant consists of one 8x5mm natural, pear cut Blue Topaz gemstone, set in a diamond cut solid 9ct gold teardrop setting. The earrings match the pendant with two 8x5mm pear cut, natural Blue Topaz gemstones, set in a solid 9ct gold, diamond cut teardrop setting. A stunning pendant with earrings to match. The pendant features one 4mm round natural Blue Topaz gemstone, set in a solid 9ct gold celtic design. The earrings match the pendant, each with one 4mm round natural Blue Topaz gemstone, set in a solid 9ct gold celtic design. A stunning set comprising a pendant (on chain) and earrings made of sterling silver with London Blue Topaz inlaid in the face. The set is in excellent condition. Sky blue topaz solitaire ring. Beautiful matching stud earrings. Fabulous set comprised of solitaire stud earrings, size 8 trilogy ring, and trilogy pendant. Quality settings in 925 sterling silver, and beautifully cut white topaz gemstones. Brand new and unworn. Comes with certificate of authenticity. Hot Diamonds Bliss Sterling Silver Diamond and white Topaz Earrings. ELEGANT TRILLION SET. STERLING SILVER JEWELLERY SET MADE WITH 4 CARAT GORGEOUS SIMULATED TOPAZ. This is for hygiene reasons and doesn’t affect your statutory rights. CENTRE STONE SIZE: 7mm x 7mm. EARRINGS SIZE: 16mm x 8mm. 9ct Yellow Gold Topaz and Diamond Pendant and Earring Set. Set in 9ct yellow gold. Matching in design, a lovely yellow gold mount holding beautiful octogn Topaz and round diamonds. Each stone is lovingly claw set and is articulated in the earring design. STUNNING SKY BLUE TOPAZ SOLITAIRE RING, PENDANT AND STUD EARRINGS SET. COLOUR OF THE TOPAZ IS A BRIGHT TURQUOISE. RING IS A SIZE S.
Gemstones are authentic and genuine, hence apart from looking and feeling fantastic they are also known to bestow the wearer with wonderful gifts. Genuine Facet Cut Blue Topaz Gemstones set Rhodium clad solid 925 Silver - Set of Necklace & Earrings! 9ct yellow gold drop earrings with a brilliant cut deep blue topaz gemstones at the top of the earrings dropping into a pear cut deep blue topaz. Topaz Information Blue Topaz Information Topaz is thought to enhance beauty, give its wearer longevity in life and reinforce physical strength. Pendant - overall size 24 mm x 11mm including bale (no chain). WILL ARRIVE GIFT BOXED. Hidden bail behind the pendant. Pendent width = 13mm. Earrings with Necklace. This set consists of a necklace and earrings. They both have a pear shaped CZ Topaz cubic zirconia crystal stone. This can also be a wonderful treat for your-self. Earrings - overall size 18mm x 7mm and they have an integral fastening so there is no butterfly to lose. This beautiful, handmade, gemstone pendant and earrings set is made from stamped 925 sterling silver. The pendant weighs 6.5 g and the earrings weigh 3.5 g each. A wonderful addition to any woman's jewellery box! A SET OF 5 PAIRS - LESS THAN £15 PER PAIR. #4608/4940. Solid Silver Necklace And Ring S et. T hi s is a n un wa nt ed g if t Ib el ie ve i t wa s around£ 10 0. Beautiful mystic topaz round stud earrings crafted from 9ct rose gold decorated around a 9ct rose gold and rhodium plated sparkling white diamonds halo earring jacket. Mystic Green Topaz Information. Pendant and Earring set. Classic Pendant featuring one 2.5mm round cut natural Blue Topaz in the centre, surrounded by six 1.5mm natural Blue Topaz set in solid 9ct gold. Classic studs featuring one 3mm round cut natural Blue Topaz in the centre, surrounded by six 2mm natural Blue Topaz gemstones, set in solid 9ct gold. Pendant - overall size 35mm x 13mm including bale, pendant only. GIFT BOXED. Pendant -o verall size 25mm x 16mm including bale, pendant only. Earrings -ove rall size 20mm x 16mm and they have a leverback fastening. Pendant -o verall size 24mm x 18mm including bale, pendant only. A round cluster drop earring and 45cm necklace set crafted from 9ct yellow gold, set with a round cut faceted blue topaz gemstone, surrounded with more blue topaz gemstones. Blue Topaz Earring Information. 9ct Gold Matching Diamond & Topaz Set. Dispatched with Royal Mail special delivery. Comes with complete whole set the earrings the ring and the necklace. Brought a few years back only only tried on. Never worn out. This set is absolutely stunning. Which you can see yourself. Comes all original boxes. Was brought from debenhams. Solid no flimsy stuff. Ring size P Fully hallmarked. All comes with shown in the pics. 100% feedback. Take a look at all my other items. Thanks for looking. Sparkling Boxed 9ct White Gold & Pink Topaz Pendant & Chain. Decent John Hardy 925/18K Gold Topaz Diamond Batu Sari Pendant/Ring. NICE SET.